We made glycerol stocks from our Miraculin & v0120 and Brazzein & v0120. 333 μL cultures with 666μL glycerol and placed in -80°C freezer. We miniprepped our Miraculin and v0120 cultures and our Brazzein and v0120 cultures. Miniprep done per Qiagen protocol. 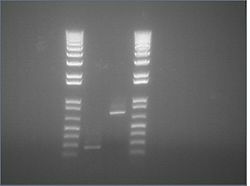 RNA extraction per Qiagen RNAeasy protocol. We made sure to apply RNAzap (RNAase-free) spray to all surfaces and instruments. only one band was visible in the gel for each reaction. Julia forgot to put the ladder in so it was not possible to precisely determine the single band size, but judging from the position of the loading dye it seemed that the plasmid had only been cut once. 3 times as much insert as vector per reaction, length of insert taken into consideration. This page was last edited on 26 September 2017, at 19:05.